Beard plus mustache styles are a great way to show off your facial hair. Because you are growing two different areas of facial hair, there is an unlimited number of different combinations you can try out. For this beard and mustache styling list, we have picked some of our all-time favorite looks. 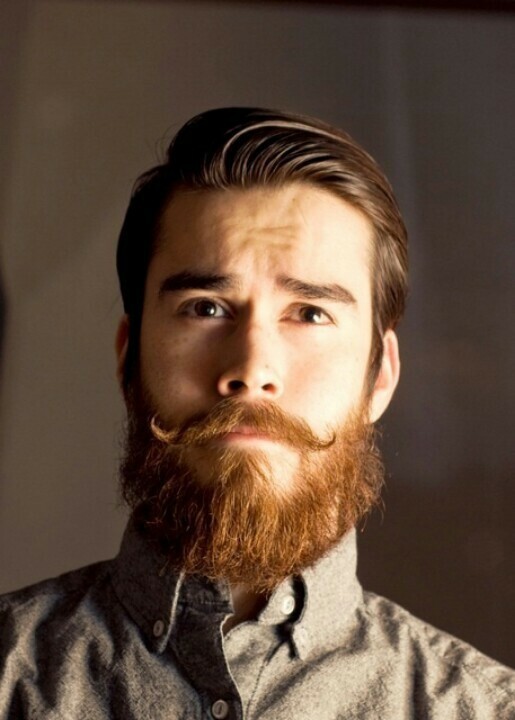 Beard with mustache styles is perfect for a vast number of occasions. If you keep your style groomed it will be the perfect professional look for the office. Alternatively, make a few tweaks to your facial hair and you will have a great look to wear for a red carpet event or dinner party. You can also create some fantastic rough and ready styles for guys who love spending time in the outdoors. Dark hairstyles can look really intense on a man. Integrate a beard and mustache so that your facial hair is really full on. This is a really serious beard style for those who love beard chic. A beard and curly mustache combo can be reminiscent of a classic English gentleman. Keep everything well-groomed to give this upper-class mustache and beard style. Tease your mustache up at the corners of your mouth to create a really refined twist on the style. You can read our post on handlebar mustache to get details on this mustache style. A short full beard and mustache style can create the magical attractive look like the above. Cobine the stubble and a full beard that’ll suit your face shape. It gives a fresh and youthful vibe to your personality. Make the most of your ability to grow facial hair by going large. Cultivate this type of beard style by growing your beard and mustache as long as you want. Trim the ends regularly to stop the style from becoming unruly. For a multi-purpose style, choose this chic and simple style. It is well-kept and unobtrusive. Light facial hair like this helps to widen up the face to give an open and honest look. A thin beard style that covers the cheeks and chin will help to elongate the face. Style the beard so that it is less heavy around the mouth and chin area. A dark color beard will also give the look much more intensity. With a taper fade beard style, you should keep the hair longer over your jaw bone but gradually fade the length away until it is a light stubble over your cheeks. A handlebar mustache compliments this style perfectly. You can give your beard and mustache more volume by fluffing them up a bit. Use your hands and beard grooming tools to spread your facial hair out to make it seem more voluminous. This is a cool beard plus mustache style for people who want to make a big impression. Patchy beard and mustache combinations are really in fashion right now. The style is a choice for people who are trying to portray effortless cool. They are also an alternative for people who struggle to grow thicker facial hairstyles. Long stubble is facial hair that isn’t quite a beard yet. Long stubble gives a really stylish “just got out of bed” look. It is great for guys who want to show off their manly credentials. This is a very simple yet stylish way to keep a beard. The beard has medium length and a somewhat un-kept touch to it. The mustache is slim and making a direct and straight angular contact with the beard without bending or curving at all. In this picture, the thick beard is covering most of the chin and jaws as well. This is well-kept and groomed beard and mustache combination. The beard and mustache are rather smaller in length. The mustache and beard are in the French style with the mustache making a descending pathway to connect with the light subtle on the jaws. There is a little growth on the chin as well apart from the subtle on the edge of the jaws as well. This is a very well-groomed and properly styled beard. The beard is very thick and a few inches long. Its mustache is first straight above the lips and then it descends downwards like a waterfall and connects with the beard. The beard is all the way, covering the jaws and the whole chin. It starts just below the outer boundary of the lower lip till it protrudes outwards. This picture is the perfect representation of the not groomed beard and mustache. They are wild and turned in random directions. The sideburns are very thick, dense, and the same goes for the mustache as well. The most interesting fact about this picture is that the chin supports just a light subtle compared to the thick and dense sideburns and mustache. This picture shows a light subtle with a light mustache. The beard is still growing but it is well groomed. The mustache is slim and is making a slightly angular curve downwards to join the light subtle. The subtle is covering the whole jawline as well as most of the chin. The debonair combination comprises full bushy beard and a long thick mustache. Thick mustache does not connect with a beard but infuses into the cheeks hair instead. Keep the cheek lines natural and trim the neckbeard for a refined look. The beard includes some inverted curls that give the above combo a slightly scraggly appearance. An elegant combination that looks equally good on the casual outfit as it looks on formal dresses. 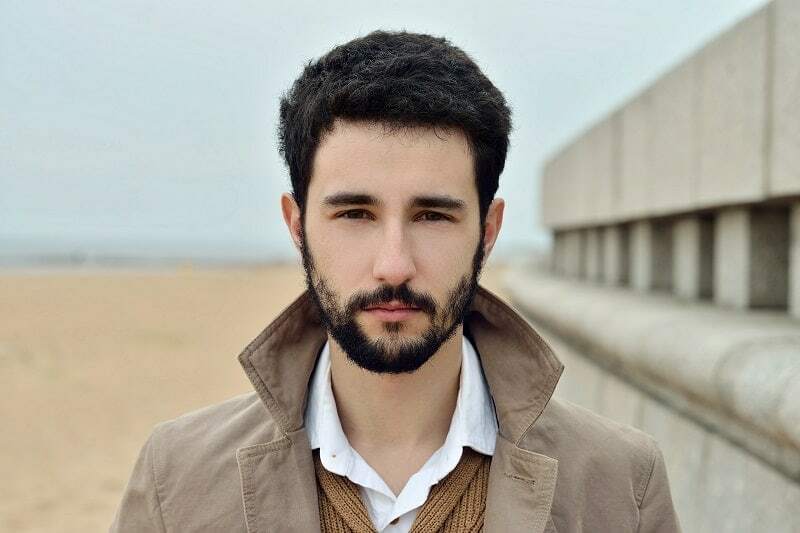 The above guy has a full beard that includes tapered cheeks and sideburns while the facial hair around the mouth looks relatively thicker. Trim the mustache neatly and connect it with the chin hair to make a circle goatee. Leave a tiny soul patch under the lip. It is the best choice to wear with this type of shambolic afro hairstyle. To achieve this look grow a chin strap along with a naturally trimmed mustache and trim the hair under the lip into triangular soul patch. It is easy to maintain. Chin strap suits triangular and diamond face shape the most. Give your patchy beard a marvelous avatar by growing a short beard rather than shaving your cheeks. Take a chance and see how the bald spot compliments the facial hair around your mouth. Thick sideburns, patchy cheeks, and mustache connecting with chin beard to make a circle goatee are the main features of the whole style. When a thick, blonde mustache paired up with a long hoary beard, it makes one of the most breathtaking bandholz beard styles, which give men a virile look. Keep the cheek line well-trimmed and let the neckbeard grow naturally while cutting its rough edges. If you want to give a modern twist to your overall look, try out this particular beard and mustache style for this purpose. It features chest-length beard, tapered sideburns, and thick handlebar mustache. Keep the cheek sides shorter than the remaining beard. Apply golden brown dye to the mustache and beard covering the chin, to highlight the area. You can achieve this modish van dyke by combining an anchor goatee and handlebar mustache. It is recommended to clean-shaven the cheeks entirely to get this particular style. Do not connect mustache with a chin beard, shape the mustache ends into slight curves instead. Side fringe hairstyle will add an extra charm to your whole look. The thick and full Irish beard accompanying the mustache makes one of the most alluring combinations. It suits almost any face shape. Groom it regularly and shape the chin hair into rounder shape for a voluminous look. Keep the cheek lines well-trimmed for a presentable look. This stylish beard style features a thick chin curtain, neckbeard, and a blonde handlebar mustache. It suits the triangular, oval and diamond face the most. Keep the chin area fluffy and slightly pointed for sharp features. Disconnect the beard from the sideburns as well. It is simple and easy to maintain style. It is a full thick beard accompanying the thick, well-trimmed mustache. Trim the hair under the lip precisely and carefully to create a distinctive soul patch. Keep the cheek lines and neckline hair well-kept and clean for a professional look. If you want to give an ultra-mannish twist to your personality, you can undoubtedly opt for this particular style. It is a common beard and mustache combination that is mostly seen in some of the Asian countries and wore by people over thirty to forty year age. Grow a thick mustache that extends the lip line and trim the mustache slightly so, it does not cover your lips. Now, grow stubble for a manly look. Undoubtedly, it is an eccentric and graceful type of beard and mustache combination. It is a short beard that features black hair under the lip and black, well-kept mustache. Cheek lines and neckline hair looks perfectly trimmed. Men of matured ages can carry this combo sophisticatedly. Boys can never get bored with a goatee because of its versatility in styles. This particular type of beard features anchor goatee, Zorro mustache, clean-shaven cheeks, and thin sideburns. It suits round, triangular and diamond face the most. If you are among those who cannot grow a full beard, you must go with this style for an impactful and manly personality. When you wait for a couple of months without losing patience, you get this beard as a reward that makes you the center of attention in the crowd. Grow it freely to your desired length. Keep the mustache distinctive rather than incorporating it into the beard. Silver blonde hairstyle, nose piercing, and brown facial hair make a striking combination ever. The golden blonde facial hair makes the style more enchanting and appealing to the eyes. It features a soul patch, the perfect line up cheeks hair, chin goatee, and mustache. Keep the length 4-5mm to achieve medium stubble. It suits almost any face shape and best for those guys who have a narrow chin area. Whitebeard symbolizes the dignity and maturity of men. Grow a full beard that connects with the naturally grown, but well-trimmed mustache. Neckline hair and cheek line hair looks neat and polished. Shape the chin hair into goatee to highlight the chin area for a distinctive look. Mix and match your beard plus mustache styles to create a look that really works for you. If you find the perfect beard and mustache look then please send us a comment to tell us all about your experiences.